And it promotes them with an awesome anime short. The Western/Midle East Religions are a minority in Japan, but that doesn´t mean they aren´t in there. And that not only includes Catholics, Lutherans and such, but also Muslims. Now the Shizuoka Muslim Association wants to build a Temple where they can pray and profess their beliefs in the already mentioned city. They decided to make an Anime vídeo promoting and telling the story that Ghaza might be safe with the faith, prayer and a miracle from Alah. The video is animated by Sakura Takagi (Kill la Kill) and Kana Kono (Dragon Ball Z: Battle of the Gods). The Shizuoka Mosque will include a Muslim School, a Library , Kitchen, Pray Area, Kids Playroom and much more. 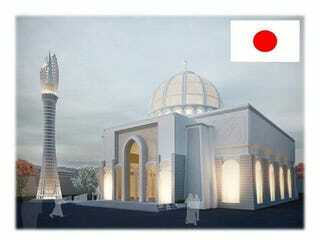 If the project it´s completed it will be the third Mosque in Shizuoka. As a Religious Catholic Person i have to say that i support this. Since one of the things i like is the hability that i have to profess my Religion in both Public and Private (without shoving it to other peoples throat), so it is nice and good that the Muslim community wants to have a litle more space to profess and show to the people what truly they believe and what are their truly teachings...Not the missinterpretations of some radicals.